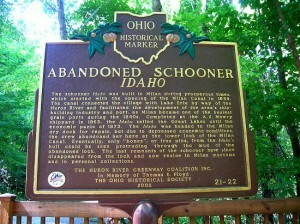 The schooner Idaho was built in Milan during prosperous times, which started with the opening of the Milan Canal in 1839. The canal connected the village with Lake Erie by way of the Huron River and facilitated the development of the area’s shipbuilding industry and port, as Milan became one of the busiest grain ports during the 1840s. Completed at the A. J. Mowry shipyard in 1863, the Idaho sailed the Great Lakes until the economic panic of 1873. The Idaho was headed to the Milan dry dock for repair, but due to depressed economic conditions, the crew abandoned her here at the lower lock of the Milan Canal. Eventually, only “bones”, or iron pins, from the Idaho’s hull could be seen protruding through the mud of the abandoned lock. 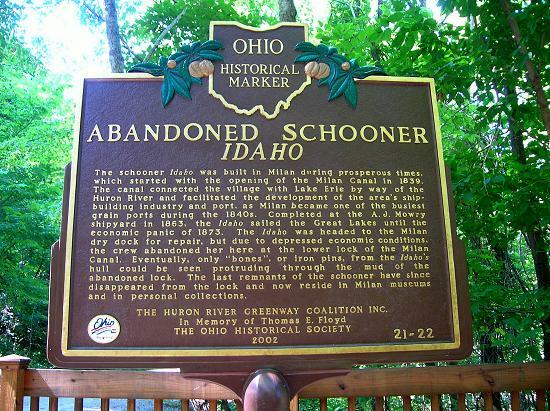 The last remnants of the schooner have since disappeared from the lock and now reside in Milan museums and in personal collections.